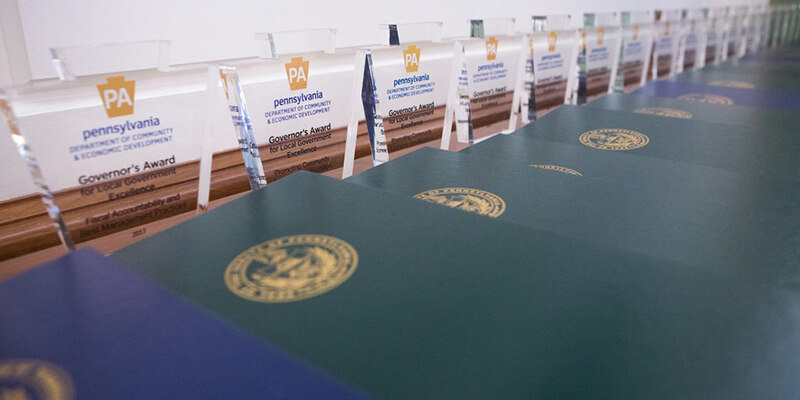 Harrisburg, PA – Governor Tom Wolf today recognized municipalities and local government officials for their dedication and commitment to strengthen their communities and better serve their residents. Ten government officials and eleven communities from across the commonwealth received awards as part of the 21st Annual Governor’s Awards for Local Government Excellence. Building Community Partnerships: Demonstrating success in fostering partnerships between both public and private stakeholders within the community. Upper Allen Township completed a project with a private developer, resolving a serious storm water flooding issue that impacted both Mechanicsburg Borough and the Mechanicsburg Area School District. A new storm water system was designed and built to carry storm water away from several flood prone areas, which, as a result, no longer flood during heavy storm events. Kennett Township purchased a 45-acre property in the township to create the first-ever 46-acre passive recreation park and two dog parks with mowed perimeter and internal trails, community gardens, a children’s play area, a variety of meadows, and an orchard. The creation of this park addressed the community’s desire for dog parks, trails, community garden plots, and meadows for all to enjoy. Promoting Community/Economic Revitalization: Direct involvement in efforts that revitalize a designated residential, commercial, and/or industrial area or property, and/or alleviates blight and deterioration and returns properties to their most productive use. Geistown Borough leadership created a volunteer committee to collect, organize, and electronically present municipal/county/state regulations/ordinances/laws, municipal points of contact, and county assets in a “one-stop shopping” opportunity for business professionals. This volunteer project met the number one grievance expressed by local businesspeople on how to deal with the complexity of developing businesses within and across a multi-level tier of governments, and was recognized as a success by both local governments and the business community. The Borough of Castle Shannon developed and acted upon a defined community development/revitalization strategy designed to capitalize on existing community strengths while simultaneously promoting new development initiatives. Castle Shannon has re-emerged as a destination point in the South Hills and continues to focus its revitalization initiatives developed through a strong and engaged public/private partnership. Innovative Community/Governmental Initiatives: Instituted an innovative approach to carry out community/governmental functions that resulted in cost savings, increased productivity, improved risk management, and/or overall service delivery efficiencies/economies of scale. The Dauphin County infrastructure project combined several sources of funding, each of which would have been inadequate to meet the infrastructure need alone. The project accomplished so much more for the county’s residents than the funding sources could have done individually, and simplified the complex task of project delivery by managing the design and construction of infrastructure for local governments lacking the necessary experience. Other Pennsylvania counties are looking to replicate what Dauphin County has done due to its success. Fiscal Accountability and Best Management Practices: Instituted a process, policy, and/or procedure that enhanced its fiscal accountability and utilization of resources and assets, and which can serve as a model for other local governments to use as a best management practice. The Township of Worcester created an initiative that employs more words than numbers when it comes to their budget. Every budget category includes an easy-to-understand narrative explaining key receipts and expenditures and is easily understandable by residents. The budget is fiscally responsible, and a best management practice that would be beneficial for every municipality in the commonwealth to use. Intergovernmental Cooperation: Engaged in an intergovernmental cooperative agreement/arrangement in which the service, function, and/or activity involves two or more governmental units. The Borough of Sykesville has elevated the overall quality of the water in the borough to the highest level. The borough is a water customer and a water provider within the surrounding portion of neighboring townships (Winslow Township/Jefferson County and Brady and Sandy townships/Clearfield County). The community is the beneficiary of the commonwealth’s leadership in water quality through PENNVEST. The entire area has grown and prospered given the stable and safe addition of unlimited quantities of potable water. Middletown Township brought together 37 municipalities (across Bucks, Montgomery, Chester, and Delaware counties) to perform a large-scale streetlight upgrade. Based on the guaranteed scope and savings of each, these 37 municipalities working together will achieve annual reductions of over 10,000 megawatt hours, 5,400 metric tons of CO2 emissions, and $900,000 in energy and operational costs. Danville Borough, working closely with the Town of Bloomsburg, established an intergovernmental agreement for recycling services. The proposal for recycling services provided to Danville by Bloomsburg allowed the borough to continue to provide uninterrupted recycling services with no lag time to rebid and no increase in cost since its inception in 2015. Health and Wellness Initiatives: Direct involvement in efforts to provide health and wellness benefits to a community. East Goshen Township created the Fit and Fun in the Park initiative, a partnership of like-minded individuals, community organizations, elected officials, and municipal staff with the goal of improving the health and wellness of township residents. It was driven by a strong social media presence and is a sustainable endeavor that will continue to grow over the years as the entire East Goshen community moves towards increased health and wellness. DCED’s Center for Local Government Services sponsors Local Government Day annually to honor local governments and officials who serve their communities and improve their quality of life.